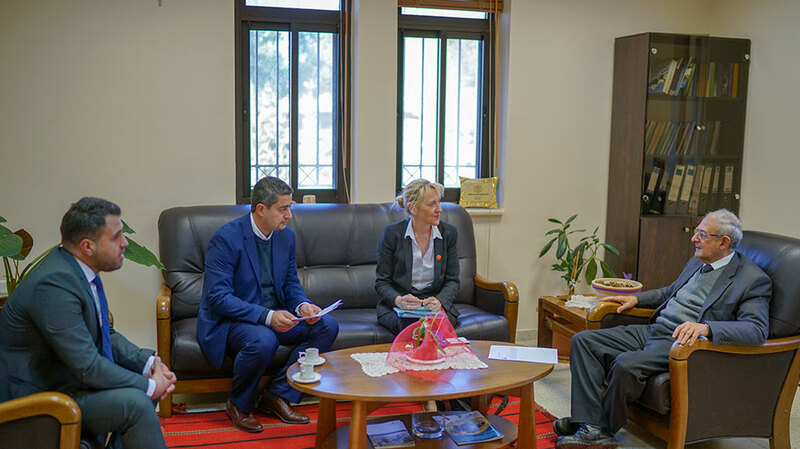 of On February 5, 2019, the Director General for International Cooperation in the Austrian Federal Ministry of Education Barbara Weitgruber met with Birzeit University Vice President for Academic Affairs Henry Giacman, administrative and faculty members to promote mutual academic and research relations and discuss areas of potential future cooperation. The Representative of Austria in Palestine Andrea Nasi accompanied Weitgruber in her meeting, which was attended by Birzeit University’s External Academic Relations Officer Amir Khalil, the Director of the Center for Development Linda Tabar, the Director of the Muwatin Institute for Democracy and Human Rights Mudar Kassis, and the researcher and Survey Unit coordinator for the Center for Development Studies Ayman Abdul Majeed. Birzeit University and a number of Austrian academic and non-academic institutions are partners in several projects and exchange programs within the Erasmus+ program. Most projects are conducted with Birzeit University’s centers and institutes including the Center for Development Studies and the Center for Continuing Education, along with the Faculty of Engineering and Technology, and the Faculty of Graduate Studies. Throughout the cooperation under the framework of Erasmus+, Birzeit students were offered exchange opportunities in the University of Vienna and Vienna University of Technology. During the meeting, Tabar discussed with Weitgruber the project “Rooting Development in the Palestinian context, which will be conducted in cooperation with the Department of Development at the University of Vienna. The project aims at stimulating critical and constructive debates on the case of development in Palestine after the Oslo accords, through engaging Palestinian youth from the West Bank, Gaza strip, and refugee camps in Lebanon and Jordan in contributing in strengthening popular forms of development as well as collective consciousness and practices. The meeting comes in line with the visit of the Austrian President Alexander Van der Bellen to Palestine.